ALBUM REVIEW: ‘Shape Shift With Me’ by Against Me! The definition of ‘rockstar’ has advanced from images of drug-fuelled debauchery and chucking TVs out of hotel windows. It’s morphed into its own umbrella term now, covering musicians who have any sort of impact on the wider world, be it with their music or through other means. By that criteria, Laura Jane Grace is one of the biggest rockstars in the world. Since coming out as transgender in 2012, the Against Me! frontwoman has campaigned mercilessly for LGBT rights, from raising money in conjunction with the Happy Hippie Foundation to raising awareness of her own struggles and transition on Against Me!’s 2014 album Transgender Dysphoria Blues. On new album Shape Shift With Me, the thematic progression continues, with the focus this time being on love from a transgender perspective, with Grace describing the album as “the transgender response to The Rolling Stones’ Exile On Main St., Liz Phair’s Exile In Guyville and The Streets’ A Grand Don’t Come For Free“. While there doesn’t appear to be any explicit connection to those three records, the topic of relationships on Shape Shift With Me is remains prominent, and tackled in a way that Against Me! have made their calling card – snarky, biting and critically erudite. And while even the most ‘standard’ tracks pack a punch – Boyfriend sees Grace lobbing volleys of disdain at an ex-partner, while Rebecca details a friends with benefits relationship – it’s the ones that pack in the heaviest sentimental weight that are the album’s standouts. The most obvious one is Delicate, Petite & Other Things I’ll Never Be, an unsettling noir score of a track that sees Grace exploring her own femininity and the view of the transgender community in a society that views them as “The dirt under their nails” in an unflinchingly candid and cutting manner. Then there’s Norse Truth, Grace’s startlingly uncensored diatribe that’s so riddled with bile and venom that you almost feel sorry for whoever’s on the receiving end. It’s the production that really ties these songs together though. It takes the earthiness of Transgender Dysphoria Blues and roughs it up a bit for something a lot scratchier and more lo-fi, something that complements the rawness of the subject matter fantastically. And while missteps are present – Crash can feel a bit thin and tinny at times – they’re incredibly rare. Rather, it’s a style that matches the tumult of the lyrical content while reflecting the ageing of the band; there’s a world-weariness implied by the production, but one that has no impact on the rambunctiousness of the actual songs. It’s also a surprisingly diverse Against Me! album sonically – while the band’s typically rousing punk dominates in tracks like on 333 and Dead Rats, they also dip their toes into rollicking cowpunk (Haunting, Haunted, Haunts), rugged garage rock (Suicide Bomber) and serpentine post-punk (Delicate, Petite & Other Things I’ll Never Be) with equal success. It all remains constantly cohesive too, thanks both the overarching themes and production that make for a full body of work. That’s why opener ProVision L-3 stands out as the weakest track, snapping the thematic thread in favour of a track criticising the current state of distrust towards foreign nations. With a closer dissection of the subtext, there’s probably something there that slots in with the rest of the album (knowing Laura Jane Grace’s deft lyricism, there’s a high chance that there is), but on purely face value, it feels like an unrelated prologue that stands out, and not in a good way. But in reality, any complaints to be had about Shape Shift With Me are nitpicks at most, only because Against Me! have fallen into a groove of such extraordinary consistency. It’s not in the same league as their borderline classics like New Wave and doesn’t have as much widespread appeal as Transgender Dysphoria Blues, but it’s still another great Against Me! album, incessantly smart and refusing to hold itself back. And after seven albums and nearly twenty years, that’s no mean feat – Shape Shift With Me is proof, if any was needed, that Against Me! are not only one of the best, but one of the most important bands around. 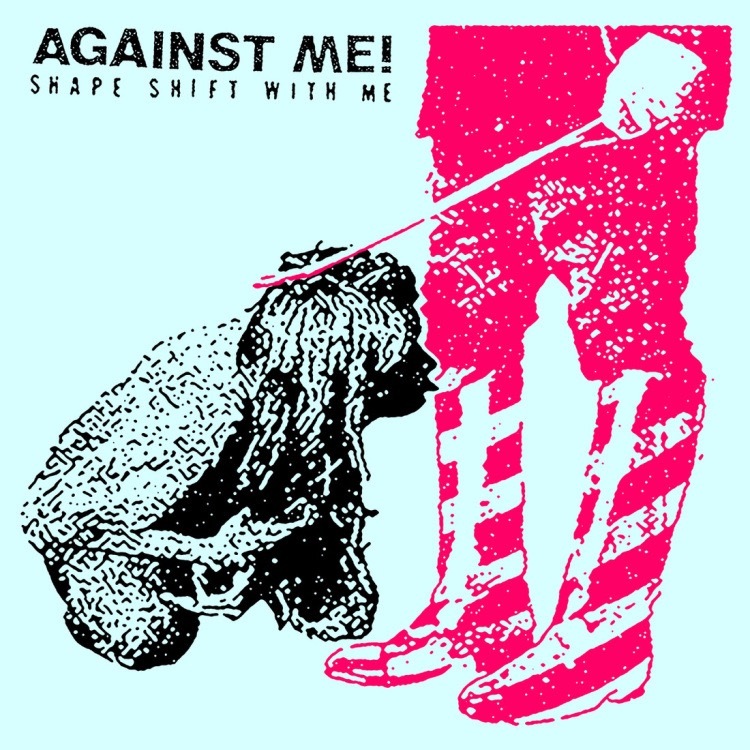 ‘Shape Shift With Me’ by Against Me! is released on 16th September on Total Treble Records.